Ships today if you order in the next 8 hours 17 minutes. Dried yeast fermentate is a complex fermentation product. It is an all-natural, high-metabolite immunogen that nourishes the immune system in order to help strengthen it and maintain wellness. Dried yeast fermentate is rich in amino acids, vitamins and enzymes that support health. Multiple randomized trials noted diverse and significant benefits against cold and flu symptoms and seasonal allergies with a dried fermentate derived from Saccharomyces cerevisiae. Animal studies also show that it has the ability to reduce swelling and edema severity. 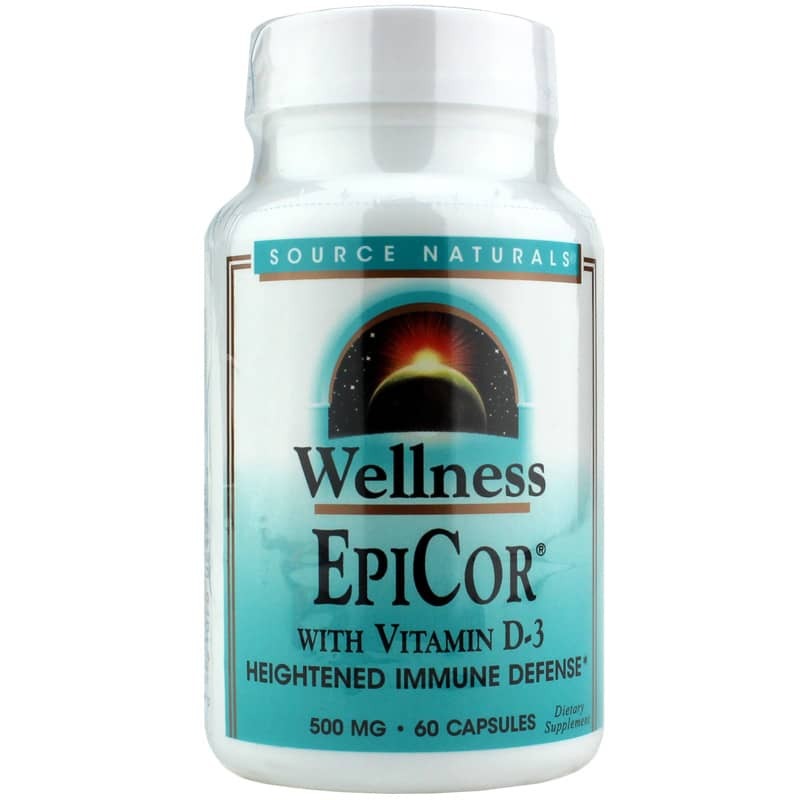 Source Naturals offers a dried yeast fermentate supplement with added vitamin D3 called Wellness EpiCor. It is a nutritional powerhouse that energizes the immune system. The added vitamin D3 in this supplement gives you 500% DV. This formulation does not include dairy, egg, soy, wheat, sugar, salt, preservatives, or artificial color, flavor or fragrance. It should be stored in a cool, dry place. If you're looking for a natural supplement that offers heightened immune defense, check into Source Naturals' Wellness EpiCor. Order online today! Other Ingredients: gelatin (capsule), microcrystalline cellulose, silica, and magnesium stearate. Contains NO: dairy, egg, soy, wheat, sugar, salt, preservatives or artificial color, flavor or fragrance. If you are pregnant, may become pregnant, breastfeeding, have kidney, parathyroid or any lung disease, cancer, or are taking any prescription drugs, consult your health care professional before using this product. Do not use if either tamper-evident seal is broken or missing. Keep out of the reach of children. Store in a cool, dry place. atural Healthy Concepts is an amazing place to buy from... so fast and easy! !